We also offer Summer Memberships for Families and Individuals for those who prefer to utilize our swimming and tennis programs during the summer months. Please stop in for a visit. 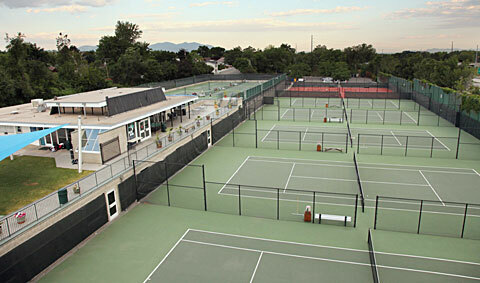 Our dedicated team at the Salt Lake Tennis & Health Club will make your visit as enjoyable and helpful as possible. The club is centrally located just southeast of Sugarhouse park. If you live in the Millcreek, Foothill, South Salt Lake or Sugarhouse area it is a 5 minute drive. For anyone else, you simply take the 13th east exit off of I-80, then to 2471 South and 1700 East. Two viewing areas on the 1st & 2nd floors overlooking courts #9-14. These areas have floor-to-ceiling glass and are heated and air-conditioned! Turf area for soccer and sports for children 3-13. Play in tournaments to test your skills in singles or doubles. Are you tired of the crowded public swimming pools or would like something for your younger kids to do instead of play video games all summer? Take the whole family to the Salt Lake Tennis & Health Club pool every summer and enjoy a fun, safe atmosphere. The kids can enroll in any level of swimming program from beginner to the highest competition. It’s a great place for the kids to be outside doing something physical in a place where there are responsible supervisors, lifeguards and instructors who get to know them and look out for them. There is also a great cafe in the clubhouse which serves breakfast and lunch in case they get hungry. Kids summer workshop sessions: You can sign the kids up for two week sessions that teach everything from basic strokes, competition swimming and diving. Swimming and Diving team: The Salt Lake Tennis & Health Club team is the best in the area. Winning the conference championship several times. They have the best swimming coaches headed by Julie Tate. It’s such a positive, healthy, fun activity for all kids. Pool is closed for the season.